With the round up of New York Bridal Week there's a whole host of new and gorgeous trends on the market for 2015's upcoming Brides. With Olivia Palermo setting the precedent for all Brides-to-be out there, we have seen a rise in the 2-piece wedding dresses. From Palermo's soft cashmere jumper paired with silk organza skirt to Houghton's catwalk show-stoppers this is certainly a trend for Brides wanting to achieve a relaxed, comfortable yet chic look for their Wedding Day. The key to this look is a relaxed top in beautiful soft fabrics paired with a show-stopper skirt. Choose Tulle or Silk Organza to achieve an all-out Princess shape skirt paired with a killer pair of heels circa Carrie Bradshaw style. Or, for the more contemporary, daring Brides finish this look with tousled, un-done hair and barely there make-up (Vera Wang style). Taking us back to the Grunge of the 90s this look encompasses a key Bridal Trend for 2015 whilst rebelling from all Bridal-norms. Seen all over the catwalks of Fashion Week and the New York Bridal Market are plunging V- necklines, on classic silhouette gowns constructed in the most beautiful of fabrics. For a sophisticated look opt for this neckline with slim fitting skirt tailored in a silk crepe satin (Reem Acra style). Take inspiration from the Hollywood Glamour era and style this gown with all-out glamour embellishments and a bold red lip. As the soft romantic hues of Blush fade away the more striking Blue tones are ready to take its place as the new and daring Bridal shade. Granted, this is not one for the traditional Bride but the past few years have seen a rise in Brides taking a wander away from the conventional shades of White and Ivory for more striking Bridal shades. Theia combines two huge bridal trends of the moment with a midriff bearing 2-piece in a beautiful blue Jacquard fabric whilst Claire Pettibone encompasses the luxe-hippy trend perfect for Boho- Brides in a current icy blue shade. Ever since Poppy Delevigne stepped out at her Moroccan nuptials in that custom-made Emilio Pucci gown Boho Brides everywhere have gained a new sense of Bridal style. Perfect for Beach and country weddings, this Bridal looks allows the Bride to feel super- relaxed (think barefoot, braided hair) whilst their wedding gown offers a true extension of their personal style. 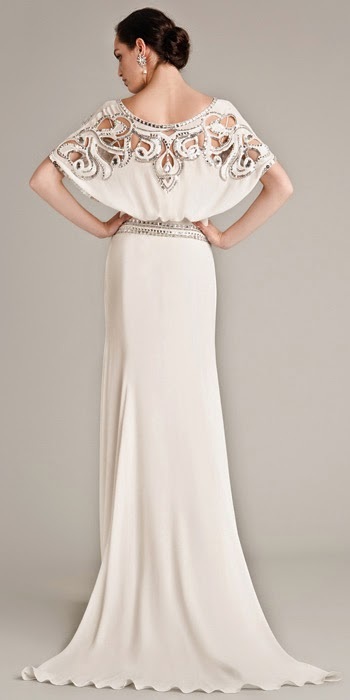 This look has been echoed on the catwalks of New York Bridal Week from British designers Alice Temperley to Inbal Dror. The key to all of these major Bridal Trends is to stick true to yourself and your own personal style. Bridalwear has moved on from the conventional norms, providing the opportunity to create something truly unique and personal to you.